A forklift is a small vehicle designed for the transportation of materials over short distances. Many of these vehicles are in civilian use and are manufactured by Traxus Heavy Industries. The S-2 Traxus Cargo Transporter as seen in Halo 3. The S-2 Traxus Cargo Transporter is a forklift designed in 2538 by Traxus Heavy Industries to replace the S-1 Traxus Cargo Transporter. As a cargo transport, the S-2 is simple and utilitarian in design. It includes a kill switch and a safety sensor to put an end to the personal injury lawsuits the S-1 model caused on Earth, Tribute and Skopje. Powered by propane, it is usually for lifting and transporting crates and boxes within the weight of 5 ton. Interestingly, it bears the GUNGNIR symbol. The S-3 Traxus Cargo Transporter, a planned successor of the S-2, was under development in the Traxus site in Voi, Kenya before halted by the Covenant invasion on Earth. The SL-4 Traxus Cargo Transporter is more nimble and less expensive than the larger S-line predecessors. In 2525, the Eridanus rebels used several robotic forklifts in the cargo holds of their supply freighters, such as the Laden, to carry and transport crates. These forklifts moved automatically and ensured that crates and other items did not come loose during slipspace transits. The S-2 forklift was used by civilians on the planet Reach, and can be seen in many locations, including the Visegrád Relay, ONI facility Sword Base, civilian settlements, and the ship breaking yards in Aszod. S-2s are also in the New Mombasa Data Center. During the Battle of Earth, the S-2 was used by UNSC Marines to organize various objects in the military base Crow's Nest. Numerous S-2s were abandoned in Traxus Factory Complex 09 during the Battle of Voi. 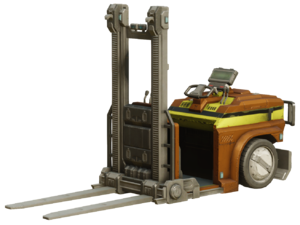 Another type of forklift was seen in the Pilvros Municipal Support Facility in the city of Pilvros on New Carthage. During colonial rebuilding efforts on the years immediately following the Human-Covenant war, Traxus introduced the lighter "SL" range of their cargo transporters, starting with the SL-4 Traxus Cargo Transporter, and found enormous commercial success. The SL-4 model became a favorite among businesses large and small across dozens of colonial worlds. "Forklifts don't die. They're just missing in action." In Halo 3 and Halo 3: ODST, it is a scenery item. It can be found on many levels, both in campaign and multiplayer, and is a Forge object. It was never seen doing its duty, as its civilian operators had either evacuated or were killed by the Covenant. Along with other civilian vehicles, the Forklift was made drivable by the player in Halo: Reach and appears in several campaign levels as well as the Firefight map Courtyard. However, it is much slower than in all the other game's vehicles, and lacks the speed to even splatter a Grunt. The only exception to this when if the enemy in question is sprinting or charging, otherwise they will merely be pushed aside. This slow speed, coupled with its exposed canopy and lack of any kind of weapons makes the vehicle largely useless in gameplay. However, it is extremely explosive and, when positioned properly, can act as a player-placed fusion coil within the campaign - an aspect which can be taken advantage of. Weapons like the Concussion Rifle are also able to push it around, making it into its own projectile. The Forklift in Halo: Reach originally had the ability to raise and lower, but it was cut due to being "crazy and pointless", more specifically, it had a physics glitch that would launch models in a high speed and height. It was also planned to be featured in Forge, but was cut. Unlike in Halo 3, in Halo: Reach, when the Forklift is destroyed, the explosion it creates is actually powerful enough to kill the player, much like the other vehicles in Halo: Reach. Strangely, if the player destroys the forklift and an enemy is killed by the ensuing explosion, the player receives a Splatter medal. In Halo: Reach, it can be used to perform the Nightfall forklift glitch. An unoccupied S-2 Cargo Transporter in Halo 3. Render of the forklift in Halo: Reach. An unoccupied S-2 Traxus Cargo Transporter in Halo: Reach. The S-2 in use, as seen in Halo: Reach. The S-2 in the Halo: Reach promotional poster that was originally for Noble Team. High-poly concept render of the forklift in Halo 4. Low-poly concept render of the forklift in Halo 4. In-game view of the forklift carrying cargo on Perdition in Halo 4. Another in-game view of the forklift on Perdition in Halo 4. ↑ YouTube: Forklifts Never Die!